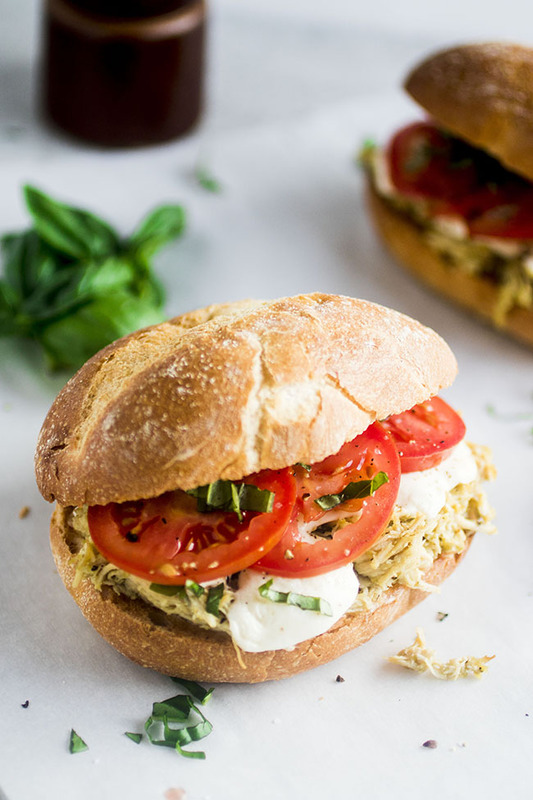 This easy slow cooker pesto chicken recipe needs just a few ingredients to build a filling and delicious chicken caprese sandwich! It’s become one of our favorite crockpot chicken recipes for busy weeknights. We’re baaaaaack from our road trip! If you’ve been following along on Snapchat/the Instagramzzz/le bloggity blog here, you might already know that we just took a much-needed mini vacation. We kept ourselves almost completely work-free, saw a ton of friends and family, drove through TEN STATES, stopped at a dozen or so microbreweries (#priorities), and brought back a full car of souvenirs for ourselves (Beer. Our souvenirs are beer). I’ll try to get a road trip recap post up in the next week or so for those who are curious as to where we went, what we ate, and exactly which breweries we stopped at (all of them. 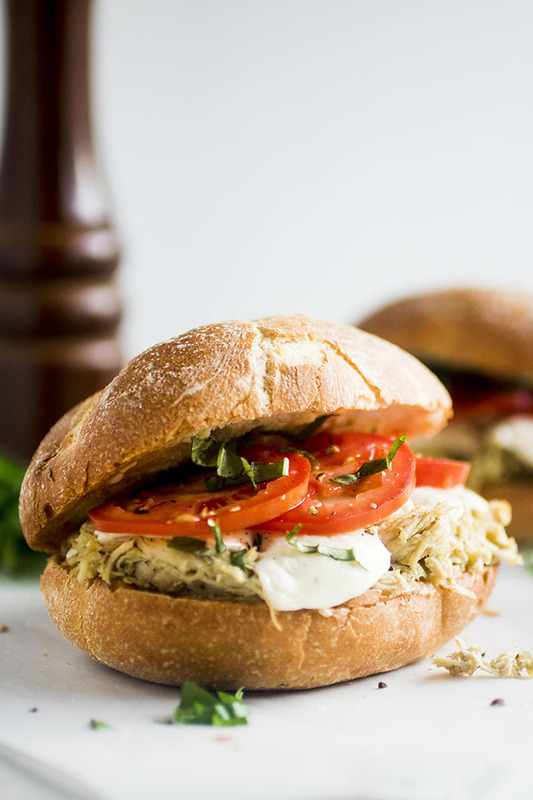 We stopped at ALL OF THEM), but for now, let’s talk slow cooker pesto chicken sandwiches! Because you neeeeeed this sandwich in your life. We were spoiled rotten on our vacation, because everywhere we stayed had this magical thing called AIR CONDITIONING. Even on the several 100+ degree days we had (THANKS A LOT, SAINT LOUIS) we could pop back into our room to cool off a bit and regroup when we needed to. But our current apartment, for all its….umm….”charms,” is not so much with the temperature control. So now that we’re home in upstate New York (where it is approximately one bajillion degrees), we’re back to melting Wicked-Witch-of-the-West-style, which means turning on the oven is a BIG BIG no-no. 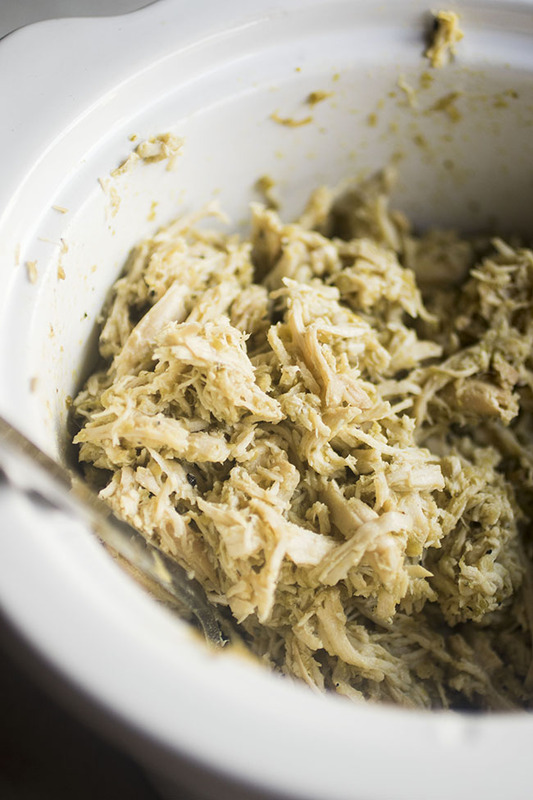 Fortunately, my slow cooker has me covered for all these too-hot-to-really-cook days – I just throw some chicken and pesto in the crock pot and let it slow-cook away without heating up my whole house the way an oven does. I actually still use the $10 Target Slow Cooker I bought when I first got to college. It’s been with me through two states, five apartments, and a Master’s degree, and it’s still going strong (although we’ve upgraded the rest of our lives a bit from illegally slow-cooking chili in my dorm room with ingredients stolen from our college cafeteria. Thankfully). 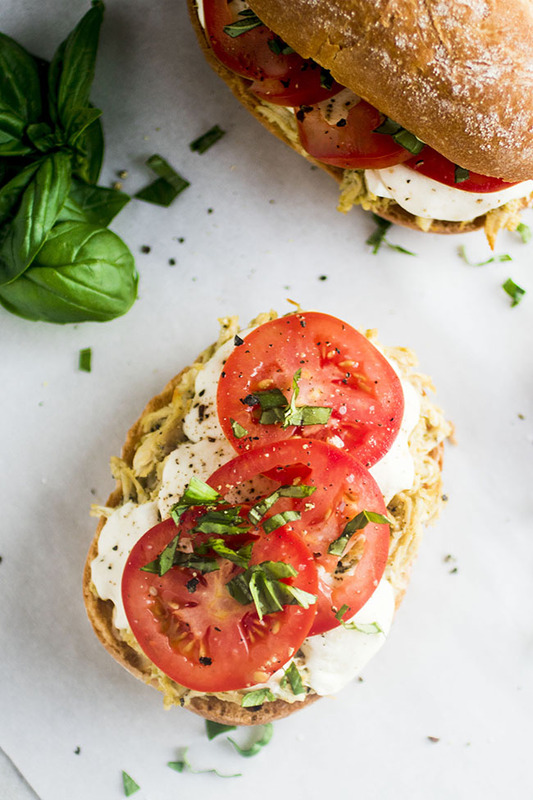 Once your chicken is properly slow-cookered, shred it up with a couple of forks and assemble these caprese sandwiches for a quick and easy dinner. Just a toasted sandwich roll and a few slices of tomato and mozzarella bring this dish together with all the flavors of summatiiiiiiime. You can use the chicken while it’s still hot from the crock pot, or keep it in the fridge for cold chicken sandwiches the next day (hip hooray for make-ahead meals!) 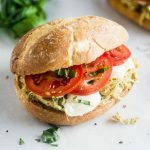 I actually like to make a double batch of the pesto chicken and save it all week long – you can put it on these sandwiches, throw it into this tortellini, or use it in a summery chicken burrito bowl. It’s also a fun way to mix up a plain ol’ chicken caesar salad. PS – For bonus points, add a garnish of fresh basil (as pictured here) and a drizzle of balsamic vinegar reduction. Like this recipe? Watch this video for four MORE of my favorite slow cooker chicken recipes! An easy slow cooker recipe for busy weeknights. Add chicken breasts, pesto, salt and pepper to your slow cooker. Cook on low for 4-6 hours. When chicken has cooked, remove slow cooker lid and let the chicken cool for a few minutes, then use two forks to shred the chicken (I do this right in the slow cooker!) As you shred, the chicken will soak up any extra pesto and moisture still in the slow cooker, so don’t worry about draining away any excess liquid. Lightly toast your sandwich rolls (you can do this in a regular toaster or pop the roll halves on a baking sheet and broil them in the oven for a minute). Spread a light layer of plan Greek Yogurt (or mayonnaise) across each of the roll halves. 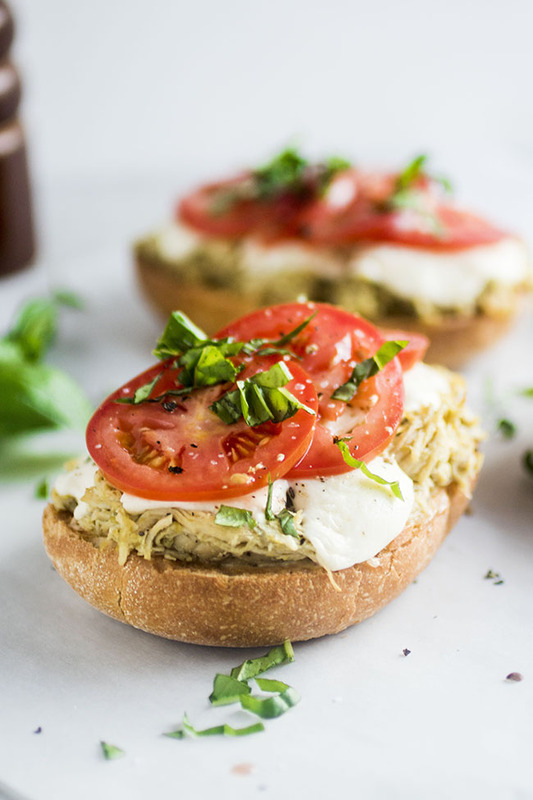 Top with a scoop of the pesto chicken, a few slices of fresh mozzarella, and a few tomato slices. Season the tomatoes with a pinch of salt and fresh ground pepper. If you’d like, you can add a pinch of chopped fresh basil for extra garnish and flavor. Place the top halves of your rolls on the sandwiches and serve immediately. I used boneless, skinless chicken breasts for this recipe, but feel free to use whichever cut(s) you like. Keep in mind that you may need to adjust the cooking time for different cuts of chicken. Cooking time for the chicken may vary depending on the size of your slow cooker. I use a relatively small slow cooker, so if you have a larger slow cooker you may want to add extra pesto or a splash of water to preserve moisture as the chicken cooks. Just keep an eye on the chicken as it cooks and use your best judgment! A well-balanced, well-seasoned pesto is the key to getting great flavor with this chicken. I use homemade basil, cilantro, pea, or arugula pesto. If the chicken needs a little more flavor than your pesto has on its own, add extra salt, pepper, or a squeeze of lemon juice to brighten it up. These sandwiches are great with hot or cold chicken – use the chicken when it’s still hot from the crockpot, or make it in advance and keep it in the fridge to assemble a cold sandwich on the fly! If you’re using the chicken while it’s still hot, the heat from the chicken will melt the mozzarella a little bit. If you want your cheese to be extra melty, pop the sandwiches in a hot oven for a few minutes to help melt the mozzarella. If you have time and are feeling ambitious, try a roasted garlic or lemon aioli in place of the mayonnaise for extra flavor! Add a handful of salad greens or baby arugula to these sandwiches to make them a little heartier. Would it be better to use Frozen or thawed chicken? Okay yeah, these are perfect. 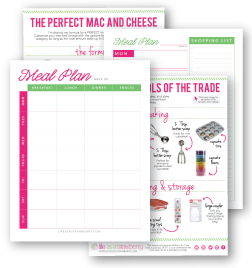 I LOVE a delicious, low maintenance dinner and this recipe is exactly that. I’ve gotta try it out!